Well it appears we're on a steady diet of electrically related questions of late (always a fascinating topic anyway). John, as I mention in my seminars and articles, the 120-volt system in an RV is a little different from conventional house wiring. The RV is wired from stem to stern with an isolated neutral conductor. In other words, the white neutral wires are not bonded to the bare copper ground wires or any metallic component anywhere inside the RV (note the "Insulated Neutral Buss" in the diagram). The bonded (grounded) neutral actually takes place at the electrical service entrance at the campground. John, as Gary has pointed out, RV electrical systems are wired with their Ground and Neutral buses floated (un-bonded from each other). There's lots of good reasons for this, but for now just accept that's how they're wired. 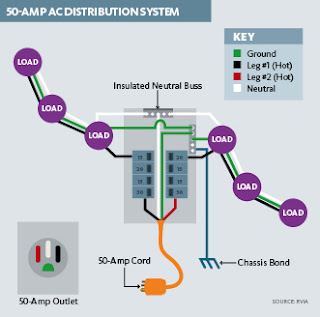 Now, when you're plugged into power from a building (your garage outlet) or campground (pedestal outlet), your RV has its internal Ground and Neutral buses "bonded" (connected) together externally as part of the serivce panel's earthed safety ground system. Again, lots of reasons for this, but the fact is you can only have a single G-N bonding point according to the National Electrical Code and RVIA building codes. When your RV is powered by its on-board generator, this G-N bond connection is created by the transfer switch set to generator mode. But when the transfer switch is set to shore power, then your RV expects the external power source to bond its Ground and Neutral wires together. Now if you have an inline voltage monitor system from a manufacturer such as TRC, SurgeGuard or Progressive Industries, your voltage monitor is checking for the Neutral and Ground voltages to be very close to each other, probably within 3 volts or so. This works well if you're plugged into shore power that's properly grounded and bonded, but this voltage protector can be tripped off by plugging your RV shore power plug into a portable generator without an internal Ground-Neutral bond. If you don't have a voltage protection device (SurgeGuard) on your RV, then you may never know that your generator has a floated neutral (un-bonded G-N bus). Contractor-type generators such as your Coleman 5000 are most probably G-N bonded internally, which is why it runs your RV just fine. However, many portable inverter generators from companies such as Yamaha and Honda (your EU3000 specifically ) have floated Neutrals (no internal Ground-Neutral Bond) since they expect an external G-N bond to happen somewhere else. And while RV-approved generator have an internal G-N bond, but it seems that many of the most popular portable inverter generators from Honda and Yamaha have floating neutrals. I don't know if they're RV-Approved or not, but they don't have bonded G-N buses. Now I discussed this very point with Honda engineering last month, and they confirmed that their inverter generators have floated Neutrals and they simply say that you should follow all local electrical codes for bonding-grounding. 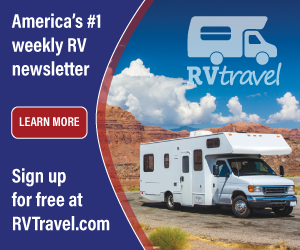 So your EU3000 isn't providing a Ground-Neutral Bond that your RV requires to think it's getting properly grounded power, while your Coleman 5000 has a Ground-Neutral bond so it operates your RV properly. Seems crazy, but that appears to be the scenario.